If ever there was an office that could lay claim to the adjective ‘fun’, Mind Candy’s home on Bonhill Street, London, is it. 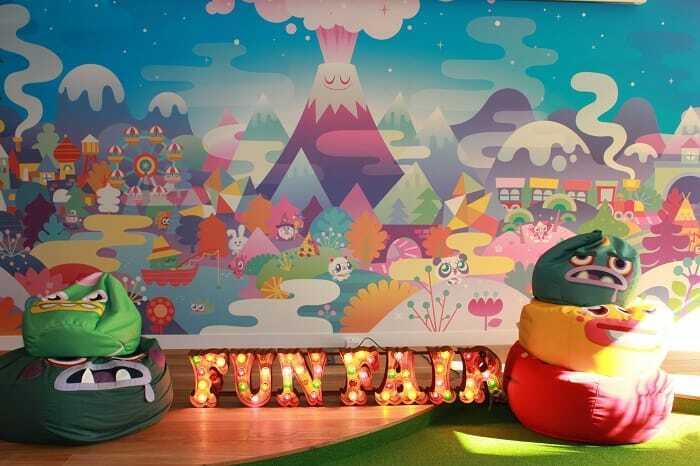 Of course, it shouldn’t come as a big surprise that the company behind the vibrant, Startups 100-winning children’s brand Moshi Monsters has put a playful spin on its workspace. But Mind Candy has taken this a step further, resulting in what The Telegraph has dubbed Britain’s “coolest office”. 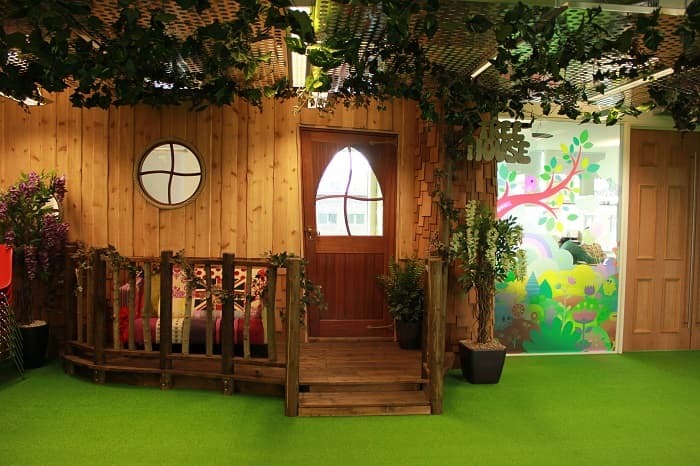 The reception area appears to have been inspired by a treehouse; with leaves dangling from the ceiling, a vibrant green astroturf floor, a giant log-turned-reception desk and a wooden wall and doorway that mimics the entrance to a log cabin. And this theme isn’t just limited to the reception area, with a meeting room that’s filled with flowers and greenery. Here, staff can meet at a picnic table, complete with gingham tablecloth. Despite this anti-corporate appearance, it’s impossible to forget which company this all belongs to. Colourful murals dedicated to Mind Candy’s brands – which include Petlandia and World of Warriors as well as Moshi Monsters – adorn numerous walls throughout. Plush seating in shared areas comes in the form of Moshi Monster-shaped bean bags, and colourful Mind Candy branded products can be found on plenty of shelves and desks. There’s even a wall covered in black and white Moshi Monster illustrations, which staff are encouraged to colour in at their leisure. And that’s not the only childhood-reminiscent fun employees are able to have here. As an alternative to the stairs, they can ride a tube slide down to lower floors. In the reception area, they can help themselves to a sugar boost from free sweet dispensers. The most obvious benefit of an office like Mind Candy’s is that it actively encourages having fun in the workplace. And while, to some, that might sound like slacking off, there’s actually plenty of evidence to suggest that having fun at work can drastically improve employee performance. For example, a study recently conducted by the Social Market Foundation – at the University of Warwick’s Centre for Competitive Advantage in the Global Economy – found that people were an average of 12% more productive when carrying out tasks after doing something fun. In some cases, productivity increased by as much as 20%. Meanwhile, a report titled Questions and Answers About Fun at Work has reported that, in a survey of 572 HR managers, a strong percentage of agreed that fun workplaces foster better communication, commitment, productivity and customer satisfaction. It’s not hard to imagine why. By giving employees that chance to have fun, you’re encouraging them to bond and form stronger working relationships with one another. You’re giving them incentives to perform, and showing that you trust them to use the resources responsibly at the same time as proving that you care about their wellbeing and enjoyment. In a different vein, another benefit of Mind Candy’s office set up is that, from its murals to its Moshi Monster bean bags, it shows pride in its key brands and products. Such displays can foster a similar sense of pride and dedication in staff, keeping them aware of the shared goals and outcomes that their hard work is contributing to. While Mind Candy’s office design very much reflects the tone of the business and its brands and products, there are plenty of ways in which you can harness the benefits of having fun and visibly taking pride in your offering – even if you’re not a playful children’s brand. Try also to think outside the box, and think in terms of your own business. Like Mind Candy’s Moshi Monsters colouring wall, is there a fun, relaxing and creative activity you can relate to your employees’ line of work? You can get creative with this and, again, think outside the box.